WHAT ARE CBD EDIBLES? From sweet gummies to minty breath-freshening strips, CBD edibles are a simple, convenient way for you to get your daily dose of CBD. Just pop these CBD-infused edibles into your mouth whenever you feel like you need a boost! CBD gummies and CBD strips provide the same dosage every time, so you get exactly the right amount for you. CBD edibles are easy to take, wherever you are. ANY SIDE EFFECTS? CBD-infused edibles are safe, natural, and legal in all 50 states. You will not feel intoxicated or ‘high’ from taking CBD gummies, sublingual CBD strips, or other CBD edibles. People who use CBD daily report no major side effects or other unwelcome symptoms. The most common minor side effect is mild drowsiness. WHY CBDFX? If you want to be sure that anything you put in your body is as pure as can be, CBDfx edibles are the best choice on the market. Our CBD gummies and CBD strips are made with oil extracted from hemp plants grown organically at our state-of-the-art partner farms in Kentucky. That means they contain no residues from pesticides or other harsh agricultural chemicals. We use full-spectrum CBD oil in our edibles, so you won’t miss out on any of the hemp plant’s potential healing nutrients like omega-3 fatty acids. You can trust that we offer the best CBD gummies and CBD strips with no THC, because CBDfx publicly shares batch reports from an independent laboratory that has tested them. 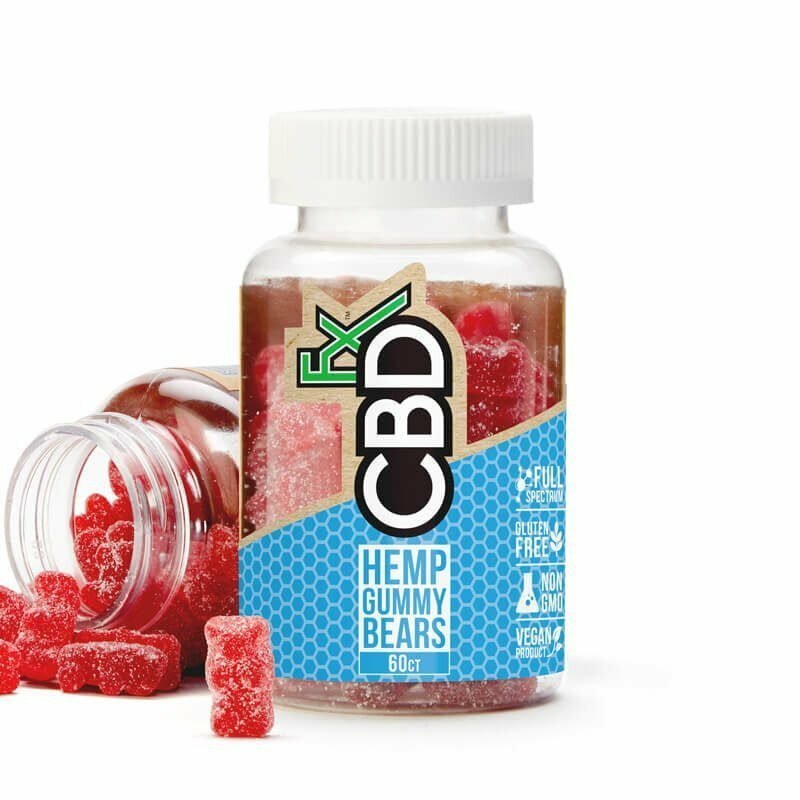 Our CBD edibles include sweet, chewy gummies, capsules, and breath strips that dissolve in your mouth. Each of our edibles are infused with CBD oil and offer a simple dosing option any time you want to load up on CBD. People of all ages choose CBD edibles because they taste great and are so easy to use—no experience or special instructions necessary. Even the dosages have been measured out for you! For example, each CBD gummy gives you 5mg of CBD. Sublingual strips are available in your choice of 15mg or 25mg doses. When shopping for CBD-infused edibles, take time to look at the ingredient list of any product you’re considering. Full-spectrum CBD oil is thought to be the most effective, because it’s loaded with many potentially beneficial nutrients that are lost when you take CBD isolate alone. Do CBD Edibles Have THC? The CBD edibles offered at CBDfx do not have THC (technically there are tiny, tiny trace amounts of THC in our CBD oil, but it’s low enough to be practically non-existent). To be certain you’re not accidentally taking a substantial THC dose, you have to find a brand of CBD edibles that you can trust. That’s because not every brand’s CBD-infused edibles come with an assurance that it does not have THC (the psychoactive compound found in marijuana). There are many different strains of cannabis plants. Some are very high in CBD, but have no THC. Others are loaded with THC. Our CBD gummies and CBD strips are made with oil extracted from hemp strains that have a high concentration of CBD and no THC. Thus, you won’t feel intoxicated when you take our CBD-infused edibles, and you will pass drug-screening tests. You don’t have to take our word for it. Our CBD edibles are tested for THC content by an independent laboratory and we post the reports online so you can see for yourself. Not having to worry about product purity is one of the things our fans love the most. Customer Karen has been taking our CBD gummies to “relieve anxiety and help me sleep through the night,” she says. “They are completely relaxing but with no ‘drugged’ feeling. Are CBD Edibles For Pain? It’s too early in the research process to confidently declare that CBD is a clinically sound treatment for pain. That being said, a team of researchers studied the impact of CBD oil on lab animals with arthritis-like symptoms. The scientists reported in the European Journal of Pain that CBD oil has “therapeutic potential for relief of arthritis pain-related behaviours and inflammation without evident side-effects.” Several other studies, both completed and underway, draw similar promising conclusions. Lynette D. concurs. “I’ve had a wonderful experience with the CBD gummies,” she says. “I have recently been in a car accident and am very sore and bruised. The [CBD-oil gummies] truly relieve some of my pain and anxiety. Are CBD Edibles For Anxiety? Researchers in Colorado evaluated the effects of CBD on 72 adults with anxiety. For nearly 80 percent of participants in the study, “anxiety scores decreased within the first month and remained decreased during the study duration” (which lasted three months), the scientists noted. A particular benefit of CBD gummies and CBD strips is that they are handy to take with you any place you might feel high levels of stress or a panic attack can flare up. “I purchased CBD gummies to help with anxiety in public, and they’ve been a huge help,” Mallory H. says. “They make me feel calm but I remain fully functional. Do You Have Any CBD Edibles Recipes? Our CBD gummies and sublingual CBD strips taste great and are ready to eat right from the package—no preparation is needed. If you want to get the benefits of CBD-infused edibles in your own diet, you can add a few drops of our high-quality CBD oils to smoothies, fruit juices, and teas, as well as salad dressings, pesto, and even homemade cookies. If you’re looking for a few simple recipes that include CBD, check out 8 Tasty CBD Oil Recipes To Spice Up Your Day. Why Are Your CBD Edibles The Best? With CBDfx CBD-infused edibles, you get premium ingredients, great-tasting products, spot-on dosage, convenient packages, and first-class customer service. We use full-spectrum organic CBD oil, so you get all of the plant’s desirable nutrients. The oil is combined with other all-natural ingredients—there are no harmful chemicals, corn syrup or any artificial sweeteners or flavors in our CBD edibles. How Long Do The CBD Edibles Take To Activate? How Long Do The CBD Edibles Last? Many people feel relief and a sense of well-being for hours after they take CBD-infused edibles. “I take one CBD gummy a day for my anxiety and it works perfectly,” says Tom Z.
Sara S. has found that two daily doses of CBD edibles keep her feeling well. “After a little over a month of consistently taking the CBD gummies, my anxiety has been almost completely resolved,” she says. “Eating one in the morning and one at night does the trick. How Many CBD Edibles Should I Eat in 24 Hours? So many individual factors, such as body type and metabolism, can impact your reaction to CBD-infused edibles that you have to experiment a little to find the ideal daily routine for you. Start by taking one dose of CBD edibles and assess your reaction to it. Wait about four hours before you try another. James L. has hit on his sweet spot. “These gummies are such a delight. There’s no guessing [about dosage],” he says. “I eat one gummy in the morning, one (maybe) in the afternoon, and one at night. Can CBD Edibles Help You Sleep? Sleep troubles are one of the most common reasons people take CBD-infused edibles and many report very satisfying results. “I have really bad insomnia and I’ve been eating a CBD gummy before bed and I sleep all the way through the night and feel super rested,” says Elly B. What Do Your CBD Edibles Taste Like? CBD-infused strips do double duty for you. They treat you to a rapidly absorbed dose of CBD (in your choice of 15mg or 25mg) and these sublingual CBD edibles have a minty flavor that freshens your breath at the same time.